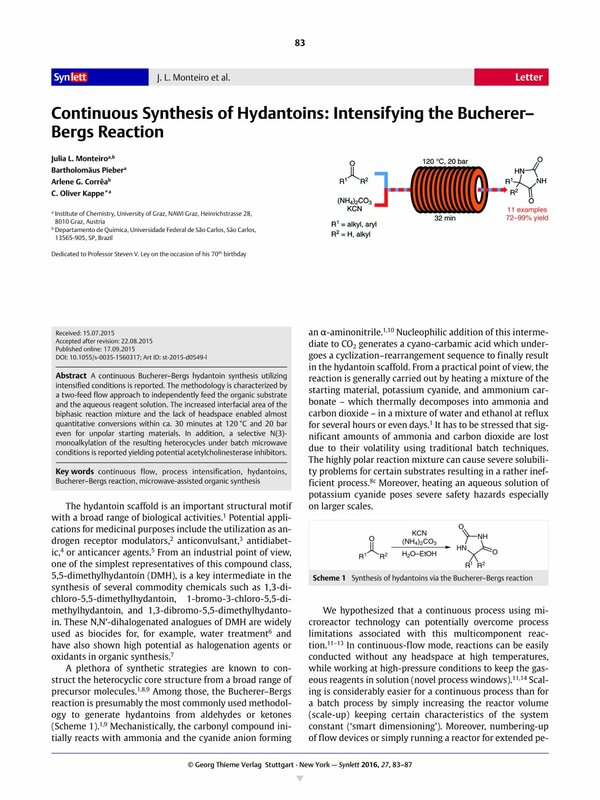 A continuous Bucherer–Bergs hydantoin synthesis utilizing intensified conditions is reported. The methodology is characterized by a two-feed flow approach to independently feed the organic substrate and the aqueous reagent solution. The increased interfacial area of the biphasic reaction mixture and the lack of headspace enabled almost quantitative conversions within ca. 30 minutes at 120 °C and 20 bar even for unpolar starting materials. In addition, a selective N(3)-monoalkylation of the resulting heterocycles under batch microwave conditions is reported yielding potential acetylcholinesterase inhibitors. Supporting information for this article is available online at http://dx.doi.org/10.1055/s-0035-1560317. 16 For details about the continuous-flow setup, see the Supporting Information. 17 The flow regimes were monitored in a transparent perfluoroalkoxy tubing between the mixing unit and the Hastelloy coil. 19 For details, see Table S1 and Figure S2 in the Supporting Information. 22 General Experimental Procedure for the Continuous Bucherer–Bergs Reaction Feed A consisting of the carbonyl compound 1a–k dissolved in EtOAc was pumped with a flow rate of 70 μL min–1 and merged in a T-shaped mixing unit with a second feed (430 μL min–1) containing an aqueous solution of (NH4)2CO3 (3.5 equiv) and KCN (1.5 equiv). The combined mixture was passed through a coil reactor made out of Hastelloy (16 mL internal volume, 32 min residence time) at 120 °C and 20 bar back pressure. To avoid precipitation of the corresponding hydantoin, the back pressure regulating unit was heated to 120 °C. The reaction mixture was collected in a sealed flask and subsequently acidified with concentrated HCl. Workup by extraction with EtOAc or crystallization afforded the respective hydantoins 2a–k in analytical purity. Analytical Data for Compound 2a Feed A: acetophenone (2.53 mmol, 5.0 M in EtOAc). Feed B: KCN (1.24 M), (NH4)2CO3 (2.88 M) in H2O. Isolation by extraction afforded the title compound in 91% yield (440 mg, 2.31 mmol) as a colorless solid; mp 197–199 °C. 1H NMR (300 MHz, DMSO): δ = 10.77 (s, 1 H), 8.62 (s, 1 H), 7.50–7.46 (m, 2 H), 7.43–7.30 (m, 3 H), 1.66 (s, 3 H). 13C NMR (75 MHz, DMSO): δ = 177.42, 156.69, 140.37, 128.93, 128.26, 125.77, 64.35, 25.39. 28 General Experimental Procedure for the Selective N(3)-Monoalkylation of Hydantoins A sealed 10 mL microwave process vial containing a mixture of the respective hydantoin (0.5–1.0 mmol), K2CO3 (1.1 equiv), and (5-bromopenthyl)trimethylammonium bromide (1.2 equiv) in MeCN (2 mL) was heated for 10–45 min at 120 °C using a single-mode microwave reactor. After cooling to r.t. the reaction mixture was concentrated. The organic material was dissolved in MeCN, and the inorganic salts were separated by filtration. Evaporation of the solvent resulted in a solid material which was carefully washed with cold EtOH before drying affording the respective N-substituted hydantoins 4a–k in analytical purity. Analytical Data for Compound 4a Reaction time: 10 min; yield: 66% (130 mg, 0.33 mmol) as colorless solid; mp 222–224 °C. 1H NMR (300 MHz, DMSO): δ = 8.90 (s, 1 H), 7.49–7.31 (m, 5 H), 3.43–3.33 (m, 4 H), 3.25–3.19 (m, 2 H), 3.02 (s, 9 H), 1.68 (s, 3 H), 1.60–1.50 (m, 2 H), 1.25–1.15 (m, 2 H). 13C NMR (75 MHz, DMSO): δ = 175.85, 156.11, 140.06, 129.05, 128.43, 125.81, 65.46, 63.14, 52.60, 52.56, 52.52, 37.94, 27.54, 25.40, 23.42, 22.03. HRMS (APCI): m/z calcd for C18H28N3O2 + [M – Br–]+: 318.217604; found: 318.217459.